Cincy Chic: When and why did you start BabysitEase? Peggy Murriner, BabysitEase president: We started BSE in 2004 because families needed options. We work and live differently than present childcare options provide support for. If you don’t have family down the street or grandparents caring for your kids, you need to have another reliable resource to act as a gap filler for your family’s childcare needs. Parents need to have excellent people available for their most precious possessions – and sometimes they may not have the time or energy to build up a network of sitters on their own. We do that for them. Because no parent should be without a helping hand – someone to love on their kids when they need to be away. Cincy Chic: What makes the BabysitEase service unique? Murriner: BSE has a website, so parents can request their sitters 24/7, and their sitters get the notifications that their favorite families are scheduling sits – even if it’s outside of business hours at 6 a.m. or 11 p.m. at night, which happens quite a bit. We also do much more of the legwork than online list services: We interview every one of our sitters, we call their references and do the background checks and even schedule for the parents. Mom and Dad just need to let us know when, and we’ll get them a sitter. They can skip all the phone calls. What keeps us in business is the excellence of the women we work with – our sitters are great people, not just great in childcare. They are making the world better by loving children, working in African orphanages, volunteering in our local schools and much more. Once you’ve met some of the fabulous people that work with us, you start to understand the high standards we hold for our sitters. Cincy Chic: You’ve started to franchise the business. Tell me about that journey. 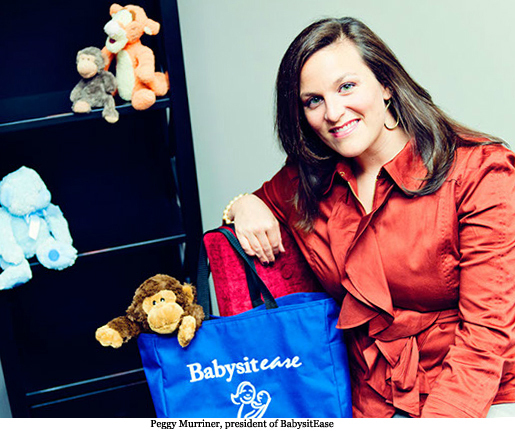 Murriner: We started franchising, because Cincinnati clients were moving away, and they wanted to bring BabysitEase to their new city. It’s been a startup of a whole new business – challenging, exciting, exhausting. We’ve grown from an idea to five cities now. It’s been pretty cool. One of our founding values is helping families to find balance – in their careers, relationships and households. We’ve been able to do that for clients over the years. It’s been neat to see that it has happened for the BabysitEase franchise owners, too. Cincy Chic: You now offer a benefits program to offer back-up care to Cincinnati area employees. Tell me why you started that and what the response has been. Murriner: There’s been a trend in corporate benefits to address wellness in a more holistic manner – mental, emotional and physical. It’s becoming more proactive than reactive, and a byproduct is lower healthcare costs. BabysitEase addresses the mental and emotional wear and tear a parent can experience when their childcare isn’t working well, and 29 percent of employed parents have experienced some kind of childcare breakdown in the past three months. It’s been very warmly received. I look forward to having more employers use BabysitEase as an employee childcare option. Studies show it reduces absenteeism, which is a cost-saver to the whole organization: 54 percent of employers report that childcare services reduced missed workdays by 20 to 30 percent. The bottom line is: BSE can help increase employee engagement. And what company doesn’t want that? Cincy Chic: What’s next on the horizon for you? Murriner: Next on the horizon is steady business growth – and raising some strong children. As business has expanded, so has our family. Our son is four years old, and we have 20-month-old twins. I’m confident the greatest legacy I’ll leave will be in what I impart to my kids. They are worth every investment I make in them. So, I’ll be building these babies to be tomorrow’s leaders. Cincy Chic: This is our "Working Moms" issue – any advice for your fellow working moms out there? Murriner: Build a strong team to support your life – inside your home, inside the office, inside your circle of friends. I aspire to do something greater than I alone could ever accomplish. It’s the people around me that join in the journey that make great things possible. Get someone else to clean your house, fix dinner once a week, give you a weekend away once a year. Don’t forget to take care of yourself: You may care for everyone, and if you break, the whole family breaks. Make your care a priority, too. Make your marriage a big deal. Because I believe my children are my life’s greatest legacy, I believe keeping my marriage in tact is the greatest service I’ll do to building that legacy on a strong foundation. I aim for a date night a week – and we usually manage two a month. We are still working to keep the love alive. In this season, it mostly looks like just getting to finish sentences without interruption from peanut buttery hands or the odor of a diaper needing changed. Cincy Chic: What do you love most about Greater Cincinnati? Murriner: I live in Ft. Thomas. I love that I have a downtown life eight minutes away, but I live in a suburban walking community. I love that I know my neighbors, and they bring me a slice of cake whenever they have a birthday party. I love that I run into clients and friends at the zoo, Museum Center and road races. For the downtown fun, we have the small town charm.